Windows 7 has a Favorites branch in the navigation pane of Windows Explorer, which provides easy and quick access to most commonly used location on the computer. By default, the Favorites links added in Desktop, Downloads and Recent Places. 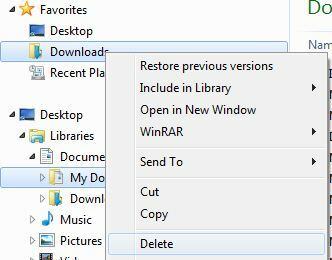 If you have additional or custom folder, library or drive that wants to added to and appear in Favorites in Windows Explorer, here’s the way to add any path or Library to the Favorites in Windows 7. 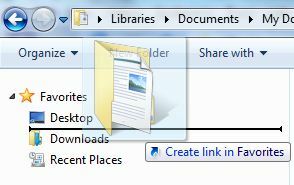 Firstly, browse to the folder (can be just drive letter only too, such as C:\) or library that user wants to add to Favorites, so that its location (path) is appearing in the Windows Explorer’s Address Bar. Then, right click on Favorites and click Add Location in Browser to Favorites. Alternatively, just drag and drop a directory, folder or library to the Favorites section in the navigation pane. Drag and drop allows user to place the newly added Favorite link in desired location among all Favorite links too. Voila, the folder, directory, path or library now appears in the Favorites for quick access. Tip: After adding to Favorites, the link can be sorted or rearranged for sequence order by clicking on a link and drag it up and down. There may be folders or libraries that user doesn’t want them to appear in Favorites anymore. 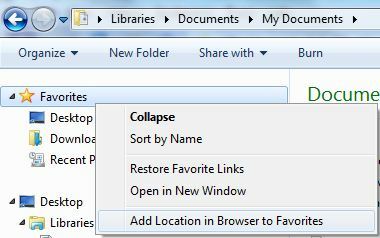 In order to remove a Favorites link, just right click on the folder, path or library to remove, and the click on Delete on the context menu. When ask for confirmation to delete file and move to Recycle Bin, click Yes. The Favorites link will be deleted. Don’t worry about data lost though, as only the shortcut in Favorites that points to actual folder is deleted, and not the physical files and folder itself.